Cocktail hour at our house has been given a green make over--we bought a Sodastream this weekend and it is by far my favorite kitchen gadget. Our recycling bin was testament to the number of bottles we used for tonic water and sparkling water (my love for Pellegrino is another story). Sodastream easily lets us make carbonated drinks at home; each time we fill up the reusable litre bottles we save 3 cans of waste. 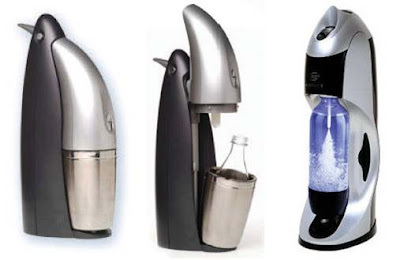 Moreover, Sodasteam doesn't need to be plugged in or use batteries, it uses refillable cartridges of CO2 to create fizz. I can now have fresh, perfectly carbonated water at the push of a button. I also love that you can add flavors to the water to create an array of drinks, including tonic. Cocktail anyone?